As a sports fan, and specifically a fan of the NFL, this quote made me think of the debate surrounding players’ conduct during the playing of our national anthem. It seems obvious that the national anthem debate is merely a specific issue in the larger debate over political views. But, thinking deeper, there are issues that cut deeply in favor of both sides. Those who are in favor of the players’ right to kneel point to freedom of expression, race relations and police brutality. Some may say those are political issues, but they should be issues both sides of the aisle care about. Those who want the players to stand point to respecting the flag and respecting service members. But once again, no NFL player who has knelt has come out to say he means to disrespect our flag or our service members. The whole debate shows that as a society we have a problem “disagreeing well,” as Mr. Stephens describes it. To put it in terms I have learned in my Alternative Dispute Resolution class in law school, “disagreeing well” can only be achieved by one thing: focusing on interests and not positions. In the national anthem debate, the positions are stand or not stand. But, as mentioned earlier, the interests run so much deeper. If we focus on “having sympathy for [our counterpart’s] motives and participate empathically with [our counterpart’s] line of reasoning,” maybe we can find a solution in the debate that will further everyone’s interests. Disagreements are necessary to move forward. But, in order for disagreements to have any utility, both sides of the disagreement must “disagree well” to bridge the gap. Very interesting post. As I was reading it I was thinking back to a class discussion last week in which it seemed that the entire class agreed to a particular resolution to this ethics problem, and for some reason I did not. I sat through the entire discussion trying to figure out what I was missing from the question that got everyone else to agree on the same result. Why was I the only one that disagreed? I assumed that because everyone that was participating in the discussion had the same idea, I must be wrong. I am not a student that frequently (or ever) raises her hand to state an opinion in class, but I was close this day. Thankfully, the professor had us discuss the problem in small groups and talk about the reasoning behind what we each thought was the best solution. Come to find out, the group of four I was in was having the same thoughts as me. We all disagreed with what the many others in class came up with for the resolution, but all sat through the class discussion with the “I must be wrong if I am the only one disagreeing” feeling. I think this goes back to what was talked about in this post in feeling uncomfortable with the possibility of having your intelligence questioned when you disagree with someone. I think this is especially true in large class settings. It makes me wonder about more effective ways to have class discussions that do not result in a class agreement just because that’s what “everyone else” is thinking too. In my first semester of law school, my Torts professor told the class on the first day that “civil discourse” is an essential element of the progress of the law. In reading Mr. Lande’s article and reflecting on my professor’s wise words, I have come up with several observations. Just because individuals (especially lawyers) have differing opinions, does not mean that the argument has to be hostile. 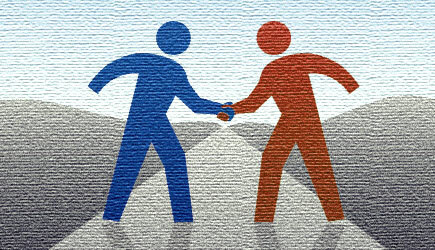 If the parties remain “civil”, unique solutions to quarrels can be reached between the parties, whilst leaving their relationship (whether it be personal or professional) intact. In this regard, “civil discourse” is almost identical to “disagreeing well.” In theories, the parties hold a sense of respect for each other, even though they disagree about something. This is an essential aspect of all ADR processes. The focus is not on who is “right or wrong” or “winning and losing”. Conversely, ADR focuses on understanding the other side’s perspective without abandoning your own convictions. Again, “civil discourse” and “disagreeing well” requires one to respect the other party enough to understand their side without giving up your own position. “Conflict” consistently has a negative connotations when it does not necessarily have to. Lawyers/mediators/arbitrators/negotiators should strive to make a tense situation (like a disagreement or even a lawsuit) less stressful by practicing “civil discourse” and “disagreeing well.” This will promote more creative solutions for complex issues. This post made me think of an article I read recently about one of my favorite Hollywood couples, Dax Shephard and Kristen Bell. Kristen spoke about how, early in their relationship, they would get into fight or arguments, healthy disagreements, and inevitably, the fight would end in Kristen storming out and driving away. After months of this happening, Dax said he couldn’t put up with that anymore because it wasn’t constructive. They would never come to a resolution and the fights would just keep happening. I thought of this article when I read the part of the article that said “what makes our disagreements so toxic is that we refuse to make eye contact with our opponents, or try to see things as they might, or find some middle ground. Instead, we fight each other from the safe distance of our separate islands of ideology and listen intently to echoes of ourselves.” By storming out of the fight in a huff, Kristen was essentially retreating to her own “island of ideology” and sitting with her own thoughts rather than hearing out Dax’s thoughts. As I continued to read this post, another part resonated with me. The author stated that “the crucial prerequisite of intelligent disagreement – namely: shut up, listen up; pause and reconsider; and only then speak…” This line emphasizes the importance of hearing out your opponent, in whatever disagreement you may be in. Whether you are in a fight with your significant other, like Dax and Kristen, or you are in a heated debate over politics, religion, or any of the hundreds of topics people love to debate, we must remember that we can’t just run away or storm out of the conversation when it isn’t going our way. We can’t retreat to our own island of ideology, but rather, we need to open up our minds to experience other’s ideologies and in order to do this, we need to be active participants in disagreements. We need to listen and understand other’s perspectives before we decide we don’t agree with them. So, moving forward, my hope is that we stop running away from disagreements, but rather, we dive into them with open minds and a willingness to hear each other out.